We are right in the middle of the flu season, when more and more tests come back positive for the influenza virus. Next to the common cold, there's probably no more familiar illness than the seasonal flu: If you don't get it, someone you know does. Despite this familiarity, there are some fascinating facts about the flu that most of us do not know. Learning about influenza reveals a global network of researchers whose daily work keeps this virus at bay. #1 Every year there is a flu epidemic. The term epidemic refers to a sudden uptick in the numbers of infection by an illness. Throughout the year, people can and do become infected with the influenza virus. But between the months of December in March, there is a sudden uptick in the numbers of people infected with influenza.That's our "flu season," which is our annual flu epidemic. #2 Type A influenza viruses are very "Type A": Ambitious, outgoing, competitive and impatient. There are three types of influenza virus: A, B, and C. Type C strains cause mild upper respiratory issues and do not cause epidemics. Type B strains infect only humans and can cause epidemics. However, Type A strains infect all kinds of animals (being bossy and ambitious) including pigs, horses, ducks, seals, whales, and horses. When an animal host becomes infected with two Type A viruses at a time, they can combine to create a new, more lethal virus. Famous Type A flu viruses include the 2009 H1N1 swine flu and the H5N1 avian flu. (The H and N refer to surface proteins.) Many dangerous Type A viruses begin in China and Southeast Asia where people live in close quarters with animals, especially pigs and birds. 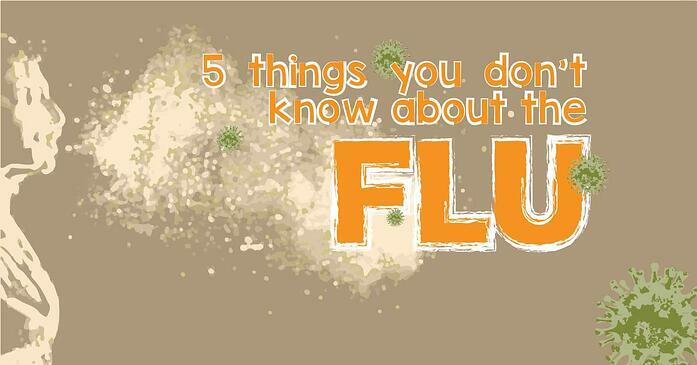 #3 The seasonal flu may affect people of a certain age more than others. This comes back to virus basics: When our body is exposed to a virus, it tries to defeat it using a barrage of different antibodies. When the correct antibody is discovered, our body makes a lot of it and (hopefully) eradicates the virus. Our immune system then filters out all the antibodies, but keeps a few floating around just in case that virus strain comes again. This means that older individuals may have been exposed to a strain that protects them later, while younger people may not have the same protection and therefore be hit harder by that strain. The global 1918 flu pandemic (called the Spanish Flu), which killed over 50 million people worldwide*, affected primarily young adults. These healthy people did not have the older generation's protection against a similar strain. This lack of antibodies, paired with healthy immune systems that in many cases overreacted to the pathogenic strain with excessive inflammation, led to one of the world's worst pandemics every recorded. Thanks to the flu vaccine, our bodies can now get copies of strain antibodies without having to become sick. How the correct strains are selected each year is a process described next. * This was before the flu vaccine was discovered in 1938. #4 Your flu vaccine began its life halfway around the Earth and half a year ago. There are over 100 influenza surveillance centers in over 100 countries around the world that test and monitor influenza every day of the year. They send their data to one of 5 World Health Organization sites, who then meet twice a year to identify the candidates most likely to cause an epidemic. (Two times a year allows for preparations for the world's two flu seasons, winter in the Northern hemisphere and winter in the Southern hemisphere.) So in February, the WHO committee is meeting to discuss our next winter's likely flu candidates. This committee makes recommendations for which strains to include, and then each country determines their own vaccine. In the case of the United States, the FDA makes this determination along with guidance from the CDC. Their determination is then provided to pharmaceutical companies who begin mass production of that season's vaccine, a 6-month long process of growing the virus in chicken eggs, matching to a suitable vaccine, testing, production and distribution. The 2016-2017 flu vaccine contains antibodies for three strains: Two Type As (H1N1 and H3N2) and one Type B (2008-like strain) and a possible second B (2013-like strain). So far, over 80% of flu cases in the US have been the Type A H3N2 strain (just over 12,000 cases). #5 The influenza virus is a leading cause of death for patients in long-term care facilities. What would be considered a mild inconvenience to a healthy individual, a case of the flu can lead to life-threatening conditions in frail elderly patients. Due to this heightened risk, with as high as a 5% mortality rate, a two-pronged approach is used to minimize exposure to these vulnerable patients. First, staff and visitors are strongly recommended to get vaccinated each year. Just staying home when sick is not enough protection, since the virus is contagious days before symptoms occur. The second approach is a vigilant environmental cleaning program, including training infection control staff. Unfortunately, the degree of infection control in long-term care facilities varies widely - and only 10% of infection control personnel have training specific to long-term care. In these environments, technologies that reduce the bioburden are critical to patient health. Do you already have your flu shot? If not, is it because you think it won't work so why bother? It is true that the flu vaccine is not 100% effective - the variety of strains circulating any given year and the rate of genetic drift make a perfect vaccine extremely difficult. However, even at the lowest estimated efficacy of 50%, that means the vaccine prevents 50% of infections, leading to slower spread of the virus in our communities. The fewer people who get infected, the slower it spreads, and the fewer people overall who are exposed. Fewer infections means fewer hospitalizations, fewer complications, and fewer deaths. It's not too late to get your shot- the CDC recommends getting the flu shot by October, but even a shot as late as January can be helpful. However, if you or a loved one does get the flu, you can learn how to clean house and help prevent further transmissions with the following infographic.